When I received several emails to ask about my opinion on Facebook Bonanza, I knew I had to write this article to warn the rest of my readers – that Facebook Bonanza is a scam. I’ve bought the program to see what it is all about for the sake of this article. So if you are considering to take a leap of faith, make sure you read my full Facebook Bonanza review and save yourself from a financial headache. Facebook Bonanza is one of those “business opportunities” that pops out randomly while you are surfing the net, or those that is linked from shady emails that you receive. It’s a good idea to ignore opportunities like these, because 99% of them turn out to be scams. In fact, I’ve just reviewed an extremely similar scam known as Income From Home Academy. I’ve personally fell for multiple scams similar to Facebook Bonanza before finally making money online, so let me teach you a thing or two about them. Generally, there are some scam hallmarks you can look out for. Let’s take a look at the first one. Here you go, the first hallmark of online scams. They like to keep you in the dark, and you don’t even know what you are paying for. This is exactly the same tactic used by Facebook Bonanza scam, where they hide the nature of the “opportunity” until after you pay for the scam (which is already too late). What is Facebook Bonanza all about? How does Facebook Bonanza work? How are you going to make your money, and who’s going to pay you? Don’t be alarmed if you can’t answer these questions – no one can, because there is simply no concrete information provided in the sales pitch of the scam. Facebook Bonanza used a lot of buzz words like “start earning immediately”, “100% risk free”, “automated money making machine” and “$397 a day” to get you excited. Once you are in a purchase mode, you don’t even question the legitimacy of the program anymore. I fell for this tactic more than I want to admit before I finally wised up. As I’ve said earlier, before I started writing reviews and cracking down these scams, I was one of the frequent customers of them. One of the main reasons I fell prey to them was the confidence boost given by the member testimonials. I kept thinking to myself – if other people can make it work, I can make it too. Unfortunately, some testimonials just cannot be trusted. It didn’t occur to me that these could be fake testimonials back then, so make sure you don’t make the same mistake as I did. I’ve done an image search on Google for the members featured in the screenshot above, and here’s the proof. It turns out that the VIP members featured in Facebook Bonanza are actually just stock photos purchased from the internet. 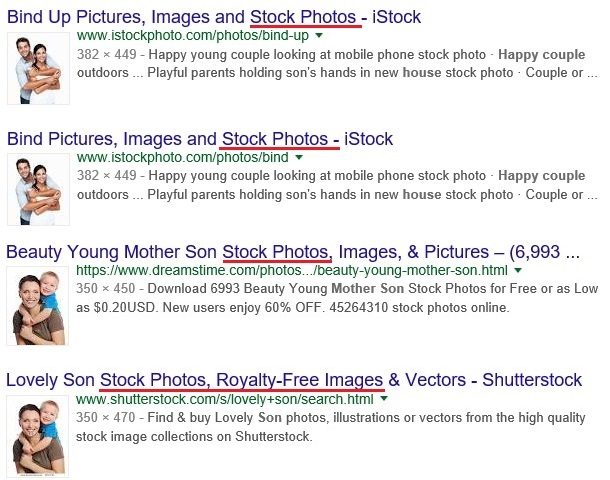 Stock photos are basically royalty-free images that are sold on sites such as shutterstock.com. Once you buy it, you can use it however you want in your advertisements. In this case, the scammers behind Facebook Bonanza bought the photos and used them to fabricate member profiles with fake names. Then they attach fake testimonials to deceive potential victims of the scam. Are you prepared for recurring monthly payment? If you are expecting only a one-time payment of $47 for Facebook Bonanza program, you are in for an unpleasant surprise. Most victims of Facebook Bonanza scam didn’t have time to read the fine prints while making payment, because they were distracted by the timer (see screenshot). You are only given 5 minutes to complete the purchase, or the 95% discount given to you will expire (and by the way, 95% discount for a $197 product isn’t even $47). So why are they giving you such a short time to complete payment? Well, the answer is simple – you wouldn’t pay for the scam if you had the time to read their fine prints. Enroll today and your card will be charged $47 (no surprise here). You will then be given a 30 day trial … unless you cancel your trial, you will be charged $69.95 every month until cancelled. You will be given a 10 day free access to the success road academy training … if you do not cancel your membership, we will charge you $1 a month until you cancel. So on top of the $47 you are paying, you unknowingly shelling out an extra $71 per month due to your carelessness. The worst thing is, most victims don’t even realize it when their credit cards are charged in the following months. Multiply $71/month with 100 victims, and now you know how the despicable scammers rip off their victims. What Happens After I Pay the Membership Fees? Is there any gold nugget in the members area? 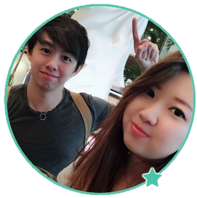 Finally we have completed the purchase and given full access, so let’s walk you through the members area. 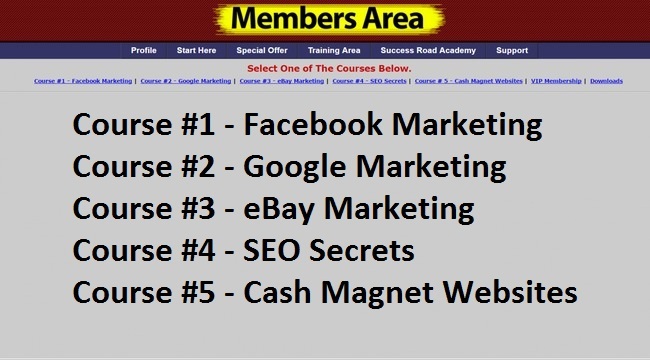 The members area doesn’t even have a name or any mention of Facebook Bonanza, so I assume that it is a generic program used by multiple scams. In fact, it’s exactly the same as what you get from Income From Home Academy kit for $19. After the customary introduction video that provides no concrete information whatsoever, I was instructed to head over to the training area for a series of video courses. I believe the videos in these courses were made in year 2012 or so. Most information are outdated, and is no longer that relevant in today’s context. For example, in Course #4 – SEO Secrets, I was instructed to stuff keywords in my website to make it rank highly in Google. However, since Google Panda algorithm update, this has been deemed as spamming. Nowadays, if you do this to your money websites, be prepared for big ranking penalty by Google. These basic informational video might have been useful a few years back, but now they do more harm than good. It’s a sign that this scam has been around for a long time. If you want actual step-by-step guide on how to make money online, check out the Ultimate Guide to Building Your First Money Website by yours truly. 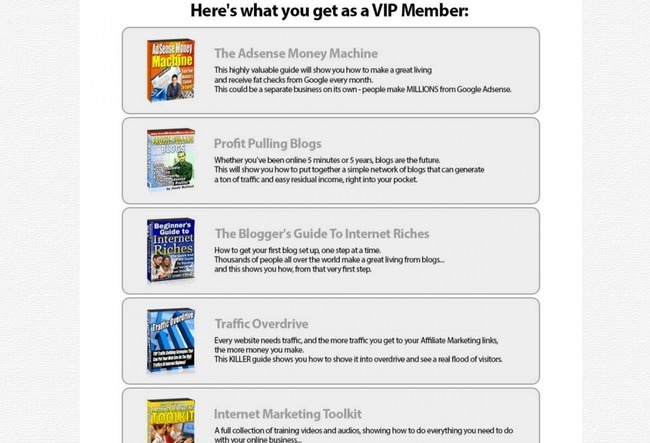 The strategies discussed are all relevant (as I continually update the guide), and it’s the exact steps I use to replicate my success in multiple money niche websites. Back to Facebook Bonanza scam. After you are done with the 5 basic courses, you will be required to upgrade to VIP member for $47 and purchase a few more programs to “ensure your success”. This is a “one scam leads to another” situation. After purchasing a scam, you will be lured to buy another, and there is no end to it. 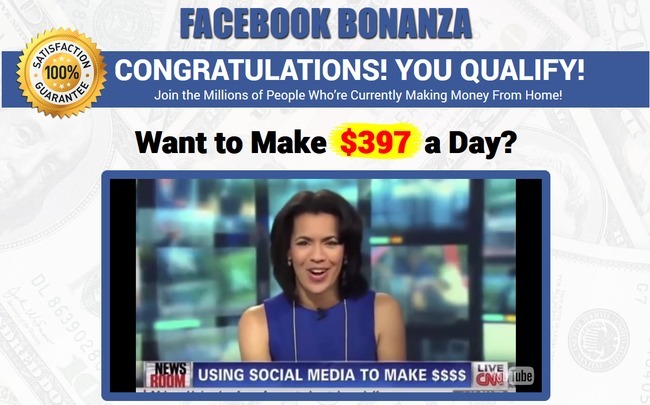 Did you get the $397 a day profits as promised by Facebook Bonanza scam? No? Then why should you buy into more scammy programs recommended by it? Should I Buy Facebook Bonanza Program? Income From Home Academy Scam Review – Stay Away! I would like to thank everyone for the word of advice. I think we all have fallen for this crap. The good thing out of this is we all are on guard now. The reason I’m writing this is because I check out all of these offers to get rich sites and this is how I found out about this site. I was checking out the Facebook Bonaza claim to riches and look what I found out. Thank you all, and let’s get even with them I spreading the word. There are complaints all over the internet on Facebook Bonanza. Why does Facebook permit the use of their name/ Why hasn’t anyone taken action with the FTC to end this rotten scheme? I was just scammed to death by these jokester and I did buy this facebook bonanza kit. I haven’t done anything with it at all as of yet. I was also a victim of identity fraud and have my bank account frozen along with a freeze on all 3 credit bureau’s at this time. I owe my bank 1800 for a fraud scam for a job I was hired for over the internet that was so real I still can’t believe this happened to me. I’m so ready to find something legitimate to make money on line. Where do I get the above listed software? Thanks. 1) If it sounds too good to be true, it probably is. There’s no free lunch in this world and don’t jump in if some opportunity offers you great wealth without having to work much at all. 2) Don’t pay for something you don’t understand. Scams generally want you to pay before revealing what’s inside, a legitimate program doesn’t work that way. If you’re looking for something legitimate, try Wealthy Affiliate. You can get started for free and only subscribe to learn more when you see results. That’s how I started making money online as well. I’m very sorry to here that you were scammed. It is so easy to get caught up in their little scams, trust me I know. If you could please tell us which one scammed you making you owe bank $1800. Thanks, Brad B. Edmond, OK. Thank you for saving my neck on this one. I’m glad I did my home work. It sounded too good to be true and I didn’t trust the photos. When I first checked Google, the top post were saying that it wasn’t a scam. So I kept scrolling until I found yours. Once again I thank you. Some review websites are paid to promote these scams, so make sure you read a few more if it sounds fishy. I have already purchased this kit. Is there a way to get my money back? It’s close to impossible to get back your initial payment. But now that you know this, you can prevent the recurring payment, which are more damaging in my opinion. Contact your bank to cancel the upcoming recurring payment with this merchant. Thank you! I’ll call my back today! I also signed up, foolishly, with these scammers. I only paid $4.97 to start and got suspicious when I saw the video. I immediately messaged them to cancel my account that I was not happy with this program. Then a day later I saw a $2 international fee on my bank account. I really got suspicious then, so I assumed it would be cancelled, wrong! A $67.48 payment hit my account today! I’m calling my bank to see if they can cancel all future payments and do something about that one. Hi Shari, calling the bank to cancel any recurring payment from the merchant is the correct move. Also look out for any other suspicious charges for the next few weeks. I feel fortunate to have read these reviews just now before setting up a domain name and web host. I was surprised to see the credit card icons again appearing in the training video. Thank you for this review, Edward. The good news is, Gianna, you can just call your credit card company and set up a three-way call with Blogatoz.org (fbbonanza). I did just that and had my $47 refunded and the subscription cancelled so as not to incur any future charges on my card. They were polite. In 7-10 days I should see the refund to my credit card.